Cleansers and masks are my two favorite skincare items to use and test. I mean, don't get me wrong - all the other stuff is fun too, but masks and cleansers often provide instant results which is so gratifying. Here are three new masks that just hit the market that you need to know about. 1. Peter Thomas Roth Brightening Bubbling Mask - Quick - you only have 2 minutes and need a boost for your skin - what do you do?! You apply this new PTR mask and BAM! Glowing skin in just a few minutes. Yes you will love the results from this, but using it is half the fun. It applies as a light gel and then begins to foam up and fizz while on your face. No stinging or burning, just tingling and feeling like your face is in a glass of Alka-Seltzer. Lol. What's left after you rinse this off is bright (like noticeably bright), soft and hydrated skin. I typically do not have a lot of time in the morning when I'm getting ready (I am not an early riser - boo), but this mask is so quick and effective that I've been using it on the days when my skin is feeling blah and needs a pick-me-up asap. And then applying make-up after is a dream. Hello, flawless! 2. Kate Somerville Nourish HydraGel Mask - Dehydrated skin sufferers - this one is for you! I try so many different hydrating masks, but very few give my skin that shot of water that I need. Soothing, nourishing and calming my skin is fine, but that final step of a really serious dose of hydration is not always there in the hydrating masks I use. This new one from Kate Somerville truly ticked off all those boxes and gave me everything I needed from a hydrating mask in one application. As you can see from the above picture, it's a delightful thick gel texture that envelopes the skin immediately and begins infusing it with moisture. An added bonus is the additional ingredients (vitamins A and C) that help to address other anti-aging concerns and dark spots. Basically it's what we have come to know and expect from Kate Somerville products - they are a one stop shop for great skin. 3. 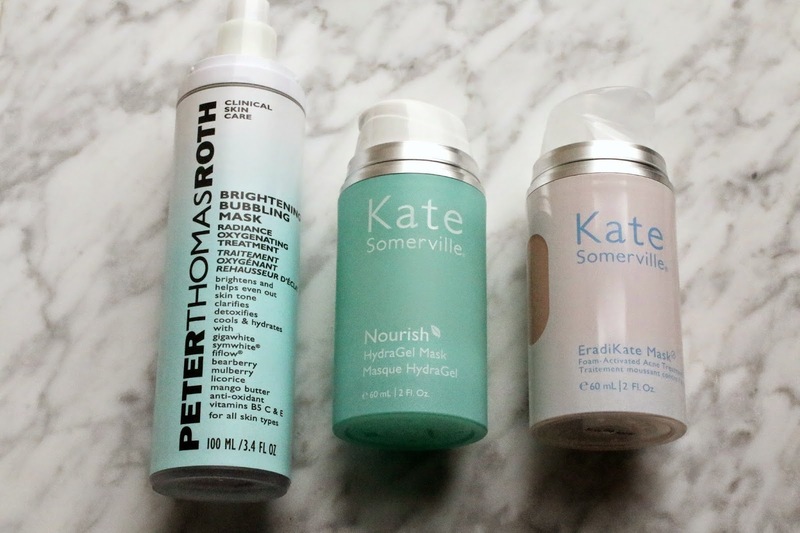 Kate Somerville EradiKate Mask Foam Activated Treatment - Can I be honest for a minute? (it's my blog, so I am thinking the answer is "yes") I don't want to need this mask. If we are truly speaking our truth, I could really be happy without ever getting any blemishes thus foregoing the need for this mask. But sadly, my hormones have another plan for my face so here I am. And at the point when my face needs an acne mask, all I care about is does it work or does it not? Thankfully this falls into the "it does" category, though sadly many do not. The texture is different from other acne masks I have because it's a thin gel that foams up and tingles as it's working. The colloidal sulfur helps to remove impurities from pores and reduce blemishes, while the advanced botanical complex helps to calm and soothe the skin. This has been one of the first acne masks that I've tried that helped to really fight those nasty blemishes without leaving my skin a barren desert of dryness and flakiness. My skin actually felt quite balanced after which I feel is a huge reason why it helped to reduce my breakout so quickly. I try to use this more as a spot treatment however unless a large portion of my face is breaking out at once (which can happen along my chin) - which I feel helps target it a bit more and allows me to treat the remaining, non-acneic parts of my face with a different mask.